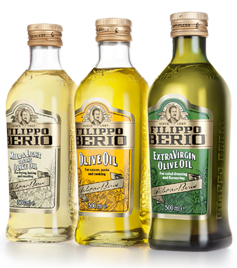 Do you have a question about Filippo Berio Olive oils? Chances are your answer is right here. If not - we'd love to hear from you! Click here to contact us. HOW DO I KNOW IF MY OLIVE OIL IS AUTHENTIC? There is no simple magic home test to check for olive oil authenticity," according the North American Olive Oil Association (NAOOA). The rumoured "Fridge Test" for testing olive oil authenticity is false. Chilling olive oil will not determine if it is 100% olive oil. Different olive oils will solidify at differing times and levels of cold. Detecting fraud is more difficult than just refrigerating or freezing the oil. As stated by the NAOOA: "Extra Virgin Olive Oil will crystallize and/or solidify at a wide variety of time and temperature exposures. All this variance is what makes extra virgin olive oil truly special. Forget the fridge, and focus instead on enjoying the wide variety of flavors found amongst Extra Virgin Olive Oils." At Filippo Berio, our olive oils are 100% olive oils and are not blended or watered down with other types of oils or additives. Our master olive oil tasters expertly blend a variety of olives to maintain a consistent profile and superior taste to other olive oils year in and year out. Olive oils should be stored tightly capped, away from any source of strong light, and at a temperature between 45°F (7°C) and the low 70s°F (21°C). A closed kitchen cabinet is usually ideal. Prolonged exposure to strong light or to higher temperatures in the storage location will significantly shorten the usable life of the oil. 1. olive oil clouds and thickens at refrigerator temperatures, and may take several hours to return to its normal clarity and consistency. 2. the full flavor and aroma of olive oil are released only at room temperature and above. ARE THERE ANY TRACES OF EGGS, DAIRY, NUTS, AND/OR PEANUTS IN YOUR PRODUCTS? My family has allergies to eggs, dairy, gluten, nuts, and peanuts. Does your plant process any of these things? Yes, it is. Look for the OU symbol (a letter U imposed on an O) for the "Orthodox Union" at the bottom of our front label. It certifies that Filippo Berio Olive Oil has been produced, labeled, and bottled in accordance with the strict Laws of Kosher. Are there any traces of nuts in your products? There are no trace elements of nuts in Filippo Berio olive oils. There are dozens of varieties of olives grown for the making of olive oil. Like the many varieties of apples, grapes, or other fruit, each olive varietal has its own distinctive flavor characteristics. The finished olive oils you buy at the store are combinations of oils from several different varieties, each selected to contribute a particular flavor characteristic to the final product (fruity, grassy, peppery, etc.). No one wants their oil to taste like somebody else's - the individuality of the flavor is highly prized and protected. WHY DO YOU USE OLIVE OILS FROM GREECE, SPAIN, AND TUNISIA AS WELL AS ITALY ? The demand for olive oil has grown tremendously over the past 20 years, as consumers have discovered its health benefits as well as its culinary versatility. These countries yield large quantities of high-quality oils, with very specific characteristics, which in turn are used to create Filippo Berio olive oils. - is cloudy instead of clear. - has a swirl in it that looks like egg whites. - has white seeds or flakes in it. - has thickened and congealed to form a layer at the bottom of the bottle. While any of these may be alarming to look at, the fact is that there is nothing wrong with the oil except that it was exposed to temperatures below 45 degrees in shipping or storage. Olive oil is liquid at room temperature. When it is chilled, it thickens and congeals - you've seen this type of congealing many times in soup or gravy when it's refrigerated. Oil that is shipped during the winter months is routinely exposed to cold temperatures. The chilling does not damage the oil in any way. It will return to its normal clarity and consistency, with no loss of quality, flavor, or shelf life, when it is warmed to room temperature or above. You can speed up this process safely and easily by putting the bottle into your dishpan and filling the dishpan with very warm tap water. Depending on the size of the container and how much congealing there is, you may need to replace the water as it cools.